Ally Campana is just a cater waiter moonlighting as a singer-songwriter when country singer Jackson Maine quite literally stumbles upon her in A Star Is Born: He’s at a drag bar trying to get a drink when he hears her belt out “La Vie En Rose.” So begins their romance: First Ally appears onstage with him for a handful of duets, then he talks her into doing a song solo; later on, he sits with her as she’s cutting her first single. 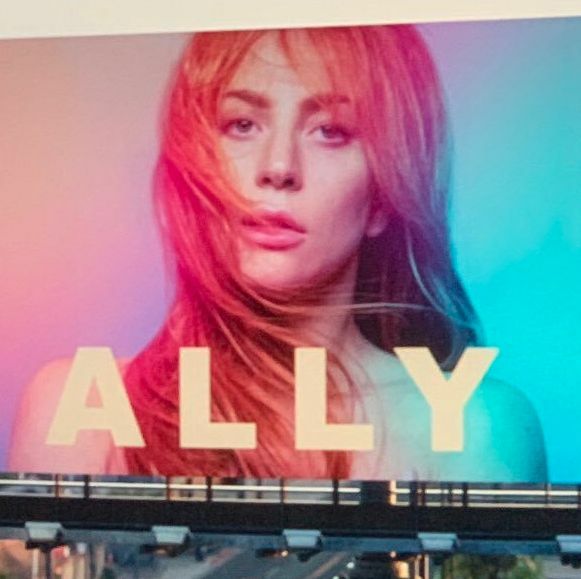 But much to his consternation, Ally is eventually rebranded into a tangerine-haired star, belting pop bops about seduction and asses in jeans. And the new Ally is memorably introduced: She and Jackson kiss on the balcony of a hotel suite at the Chateau Marmont. Across the street stands a massive billboard, featuring Ally’s face, her new look, and her name in big block chromatic-yellow letters. The sign Ally and Jackson stare at was faked for the movie, digitally added in postproduction. But as part of the Warner Bros. Oscar push for A Star Is Born, a real billboard now stands across from the Chateau, identical to the one from the film. Both are the work of graphic designer Andrea Burrell, who spoke with Vulture about coming up with the iconic design. Even though Ally is a pop star invented for A Star Is Born, her music is good enough to stand alone; her visual identity had to be equally impressive, enough so to look real. At the start, the production sent Burrell images of Ally’s wardrobe and a still from the scene it would appear in. “They couldn’t show me a lot from the film, like what they had shot already,” she said. “They gave me a still of the scene where they’re overlooking and basically it was just a blank billboard saying, ‘Here’s where it’s going to go.’” Burrell and production designer Karen Murphy looked to some other musicians’ album artwork for inspiration: “Originally, we were looking at big pop stars, but then we were backtracking because none of them felt like the right look as far as who Ally is,” she said.